Copyright © 2013 Zengjing Chen et al. This is an open access article distributed under the Creative Commons Attribution License, which permits unrestricted use, distribution, and reproduction in any medium, provided the original work is properly cited. Coherent and convex risk measures, Choquet expectation and Peng’s g-expectation are all generalizations of mathematical expectation. All have been widely used to assess financial riskiness under uncertainty. In this paper, we investigate differences amongst these risk measures and expectations. For this purpose, we constrain our attention of coherent and convex risk measures, and Choquet expectation to the domain of g-expectation. Some differences among coherent and convex risk measures and Choquet expectations are accounted for in the framework of g-expectations. We show that in the family of convex risk measures, only coherent risk measures satisfy Jensen’s inequality. In mathematical finance, risk measures and Choquet expectations are typically used in the pricing of contingent claims over families of measures. The different risk measures will typically yield different pricing. In this paper, we show that the coherent pricing is always less than the corresponding Choquet pricing. This property and inequality fails in general when one uses pricing by convex risk measures. We also discuss the relation between static risk measure and dynamic risk measure in the framework of g-expectations. We show that if g-expectations yield coherent (convex) risk measures then the corresponding conditional g-expectations or equivalently the dynamic risk measure is also coherent (convex). To prove these results, we establish a new converse of the comparison theorem of g-expectations. The choice of financial risk measures is very important in the assessment of the riskiness of financial positions. For this reason, several classes of financial risk measures have been proposed in the literature. Among these are coherent and convex risk measures, Choquet expectations and Peng’s g-expectations. Coherent risk measures were first introduced by Artzner, Delbaen, Eber and Heath  and Delbaen . As an extension of coherent risk measures, convex risk measures in general probability spaces were introduced by Föllmer & Schied  and Frittelli & Rosazza Gianin . g-expectations were introduced by Peng  via a class of nonlinear backward stochastic differential equations (BSDEs), this class of nonlinear BSDEs being introduced earlier by Pardoux and Peng . Choquet  extended probability measures to nonadditive probability measures (capacity), and introduced the so called Choquet expectation. Our interest in this paper is to explore the relations among risk measures and expectations. To do so, we restrict our attention of coherent and convex risk measures and Choquet expectations to the domain of g-expectations. The distinctions between coherent risk measure and convex risk measure are accounted for intuitively in the framework of g-expectations. We show that 1) in the family of convex risk measures, only coherent risk measures satisfy Jensen’s inequality; 2) coherent risk measures are always bounded by the corresponding Choquet expectation, but such an inequality in general fails for convex risk measures. In finance, coherent and convex risk measures and Choquet expectations are often used in the pricing of a contingent claim. Result 2) implies coherent pricing is always less than Choquet pricing, but the pricing by a convex risk measure no longer has this property. We also study the relation between static and dynamic risk measures. We establish that if g-expectations are coherent (convex) risk measures, then the same is true for the corresponding conditional g-expectations or dynamic risk. In order to prove these results, we establish in Section 3, Theorem 1, a new converse comparison theorem of g-expectations. Jiang  studies gexpectation and shows that some cases give rise to risk measures. Here we are able to show, in the case of gexpectations, that coherent risk measures are bounded by Choquet expectation but this relation fails for convex risk measures; see Theorem 4. Also we show that convex risk measures obey Jensen’s inequality; see Theorem 3. The paper is organized as follows. Section 2 reviews and gives the various definitions needed here. Section 3 gives the main results and proofs. Section 4 gives a summary of the results, putting them into a Table form for convenience of the various relations. In this section, we briefly recall the definitions of g-expectation, Choquet expectation, coherent and convex risk measures. Peng  introduced g-expectation via a class of backward stochastic differential equations (BSDE). Some of the relevant definition and notation are given here. In Section 3, Corollary 3 we will consider a special case of with . Using the solution of BSDE (1), which depends on , Peng  introduced the notion of g-expectations. Definition 1 Assume that (H1), (H2) and (H3) hold on g and . Let be the solution of BSDE (1). defined by is called the g-expectation of the random variable . defined by is called the conditional g-expectation of the random variable . Peng  also showed that g-expectation and conditional -expectation preserve most of basic properties of mathematical expectation, except for linearity. The basic properties are summarized in the next Lemma. 1) Preservation of constants: For any constant . 2) Monotonicity: If , then . 3) Strict monotonicity: If , and , then . 6) Continuity: If as in , then . The following lemma is from Briand et al. [9, Theorem 2.1]. We can rewrite it as follows. where the limit is in the sense of . 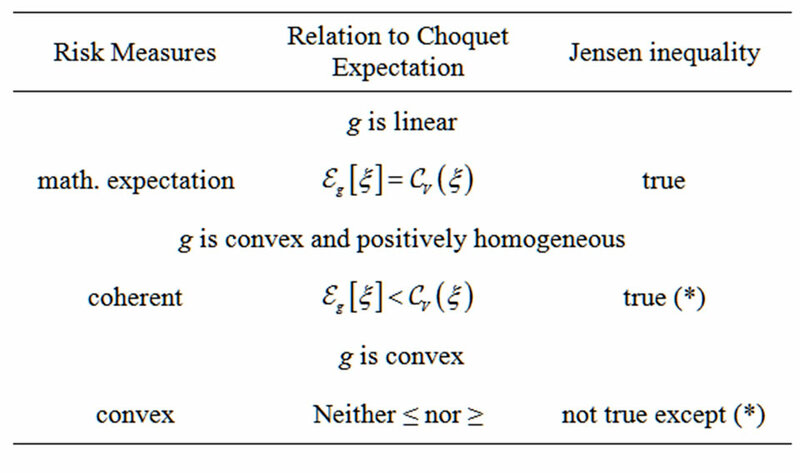 Choquet  extended the notion of a probability measure to nonadditive probability (called capacity) and defined a kind of nonlinear expectation, which is now called Choquet expectation. b) , whenever and . A risk measure is a map where is interpreted as the “habitat” of the financial positions whose riskiness has to be quantified. In this paper, we shall consider . The following modifications of coherent risk measures (Artzner et al.) is from Roorda et. al. .
4) Translation invariance: for all real number . 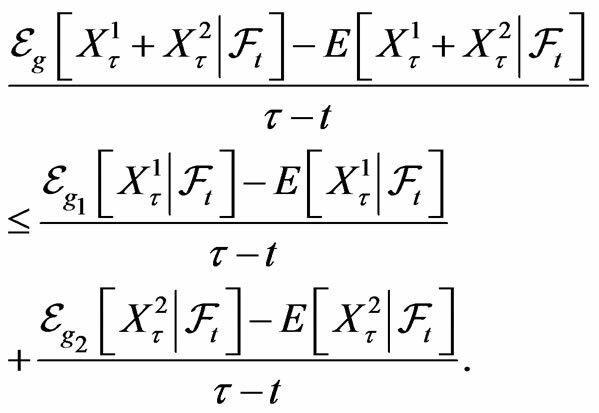 As an extension of coherent risk measures, Föllmer and Schied  introduced the axiomatic setting for convex risk measures. The following modifications of convex risk measures of Föllmer and Schied  is from Frittelli and Rosazza Gianin . 3) Properties (3) and (4) in Definition 3. A functional in Definitions 3 and 4 is usually called a static risk measure. Obviously, a coherent risk measure is a convex risk measure. As an extension of such a functional Artzner et al. [11,12], Frittelli and Rosazza Gianin  introduced the notion of dynamic risk measure which is random and depends on a time parameter . is a random functional which depends on , such that for each it is a risk measure. If satisfies for each the conditions in Definition 3, we say is a dynamic coherent risk measure. Similarly if satisfies for each the conditions in Definition 4, we say is a dynamic convex risk measure. In order to prove our main results, we establish a general converse comparison theorem of g-expectation. This theorem plays an important role in this paper. Theorem 1 Suppose that and satisfy (H1), (H2) and (H3). Then the following conclusions are equivalent. Proof: We first show that inequality (2) implies inequality 3). It is easy to check that is the solution of the BSDE (4). Applying the comparison theorem of BSDE in Peng , we have Taking , thus by the definition of -expectation, the proof of this part is complete. We now prove that inequality (1) implies (2). We distinguish two cases: the former where does not depend on , the latter where may depend on . Case 1, does not depend on . The proof of this case 1 is done in two steps. If for all , we have then we obtain our result. If not, then there exists such that . We will now obtain a contradiction. This induces a contradiction, thus concluding the proof of this Step 1. Let applying Lemma 2, since g does not depend on we rewrite simply as thus The proof of Case 1 is complete. It is clear that and note that whenever thus, Hence . This induces a contradiction. The proof is complete. Let then . The conclusion of the Lemma now follows by the definition of g-expectation. This concludes the proof. Applying Theorem 1 and Lemma 3, immediately, we obtain several relations between g-expectation and . These are given in the following Corollaries. Corollary 1 The g-expectation is the classical mathematical expectation if and only if g does not depend on and is linear in . Proof: Applying Theorem 1, is linear if and only if is linear in . By assumption (H3), that is for all . Thus does not depend on . The proof is complete. Corollary 2 The -expectation is a convex risk measure if and only if does not depend on and is convex in . which then implies that g is convex. By the explanation of Remark for Lemma 4.5 in Briand et al. , the convexity of and the assumption (H3) imply that does not depend on . The proof is complete. The function is positively homogeneous in if for any , . Proof: By Corollary 2, the -expectation is a convex risk measure if and only if does not depend on and is convex in . Applying Theorem 1 and Lemma 3 again, it is easy to check that -expectation is positively homogeneous if and only if is positively homogeneous (that is for all and if and only if for any , . Remark 2 Corollaries 2 and 3 give us an intuitive explanation for the distinction between coherent and convex risk measures. In the framework of g-expectations, convex risk measures are generated by convex functions, while coherent measures are generated only by convex and positively homogenous functions. 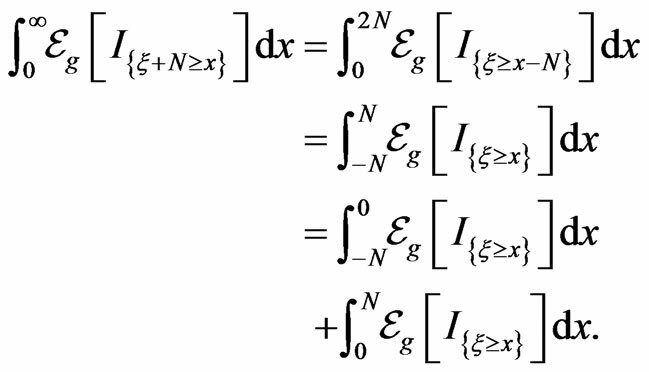 In particular, if d = 1, it is generated only by the family with . Thus the family of coherent risk measures is much smaller than the family of convex risk measures. Jensen’s inequality for mathematical inequality is important in probability theory. Chen et al. studied Jensen’s inequality for g-expectation. Now we can easily obtain our main results. Theorem 2 below shows the relation between static risk measures and dynamic risk measures. Proof: This follows directly direct from Theorem 1. Theorem 3 below shows that in the family of convex risk measure, only coherent risk measure satisfies Jensen’s inequality. Theorem 3 Suppose that is a convex risk measure. Then is a coherent risk measure if and only if satisfies Jensen’s inequality. 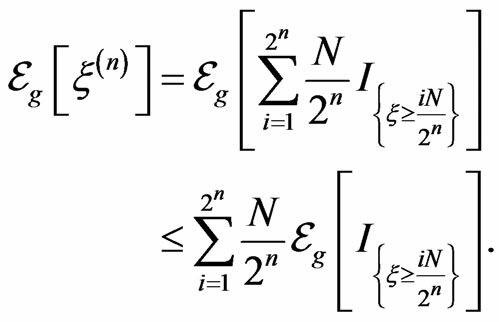 Proof: If is a convex risk measure, then by Corollary 2, is convex. Applying Lemma 4, satisfies Jensen’s inequality if and only if is positively homogenous. By Corollary 2, the corresponding is coherent risk measure. The proof is complete. Theorem 4 and Counterexample 1 below give the relation between risk measures and Choquet expectation. The prove this theorem uses the following lemma. Proof: The proof is done in three steps. Step 1. We show that if is bounded by , then inequality (11) holds. Thus, taking limits on both sides of inequality (12), it follows that The proof of Step 1 is complete. Step 2. We show that if is bounded by , that is , then inequality (11) holds. Proof of Theorem 4: If the -expectation is a coherent risk measure, then it is easy to check that the -expectation satisfies the conditions of Lemma 5. Let . By Lemma 5 and the definition of Choquet expectation, we have The first part of this theorem is complete. Counterexample 1 shows that this property of coherent risk measures fails in general for more general convex risk measures. This completes the proof of Theorem 4.
where is the density function of the normal distribution . Thus where is the Malliavin derivative. Thus can be greater than 1 whenever is near 0 and is near 0. Thus (15) holds, which contradicts the assumption a.e. . Remark 3 In mathematical finance, coherent and convex risk measures and Choquet expectation are used in the pricing of contingent claim. Theorem 4 shows that coherent pricing is always less than Choquet pricing, while Counterexample 1 demonstrates that pricing by a convex risk measure no longer has this property. In fact the convex risk price may be greater than or less than the Choquet expectation. Coherent risk measures are a generalization of mathematical expectations, while convex risk measures are a generalization of coherent risk measures. In the framework of -expectation, the summary of our results is given in Table 1. In that Table, the Choquet expectation is . Table 1. Relations among coherent and convex risk measures , choquet expectation and Jensen’s inequality. risk there is an inequality relation with Choquet expectation. S. G. Peng, “BSDE and Related g-Expectation,” Pitman Research Notes in Mathematics Series, Vol. 364, 1997, pp. 141-159. P. Artzner, F. Delbaen, J. M. Eber, D. Heath and H. Ku, “Multiperiod Risk and Coherent Multiperiod Risk Measurement,” E.T.H.Zürich, Preprint, 2002. M. Frittelli and E. R. Gianin, “Dynamic Convex Risk Measures,” In: G. Szegö, Ed., Risk Measures for the 21st Century, John Wiley, Hoboken, 2004, pp. 227-248. F. Coquet, Y. Hu, J. Mémin and S. G. Peng, “A General Converse Comparison Theorem for Backward Stochastic Differential Equations,” Comptes Rendus de l’Académie des Sciences Paris, Series I, Vol. 333, 2001, pp. 577-581. Z. J. Chen, R. Kulperger and L. Jiang, “Jensen’s Inequality for g-Expectation: Part 1,” Comptes Rendus de l’Académie des Sciences Paris, Series I, Vol. 337, 2003, pp. 725-730. *This work is supported partly by the National Natural Science Foundation of China (11231005; 11171062) and WCU(World Class University) program of the Korea Science and Engineering Foundation (R31-20007) and the NSERC grant of RK. This work has been supported by grants from the Natural Sciences and Engineering Research Council (NSERC) of Canada.